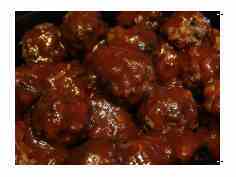 A good barbecue meatball recipe is hard to come by. Why do I say that? Because I have yet to find a recipe where the meatballs are grilled over real charcoal. BBQMyWay.com to the rescue! The typical recipe is comprised of buying the frozen product and throwing them in the crock pot with a bunch of store bought sauce. The only thing I would change is doing the meatballs over indirect heat versus direct heat. I had to baby sit them using direct heat. But, they turned out fantastically! This was a huge recipe of meatballs. I wanted to have some leftovers for meatball subs, which were unbelievable, by the way. I would suggest cutting this recipe in half unless you want to serve some sub sandwiches in the near future! 1/2 Cup of Onions: Make sure you saute' them first. Within 24 Hours If Not Sooner. Return to BBQ My Way Homepage.